The backlit keyboard case with Smart Connector retails for $149.99 USD while the protective case with any-angle stand costs $79.99 USD, both expected to be available in a variety of colors. 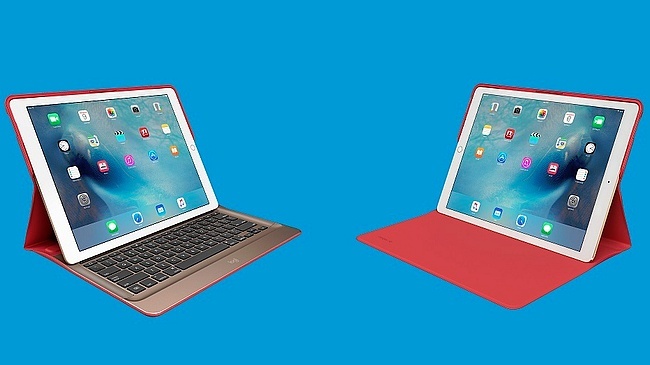 Logitech unveiled the Logi CREATE backlit keyboard case with Smart Connector for iPad Pro back in early September, and now it is ready to hit the market. Next to the keyboard case, Logitech and Apple launch a second accessory for this slate, namely the Logi CREATE protective case with any-angle stand. The first of the two is a full-sized keyboard with adjustable backlighting that has been designed to work with the new Smart Connector, automatically powering on and connecting to the tablet as needed. The protective case holds the iPad Pro as needed within a 60-degree range. Both use durable, water-repellant materials, protecting the tablet from the usual bumps, scratches, and even accidental spills it has to face. The Logi CREATE backlit keyboard case with Smart Connector has a MSRP of $149.99 USD, while the protective case with stand can be acquired for $79.99 USD. They can be purchased online and in Apple stores in the US, as well as in other markets, as soon as the iPad Pro becomes available as well. For more details, please check the press release below. NEWARK, Calif.--(BUSINESS WIRE)--Today Logitech (SIX:LOGN) (NASDAQ:LOGI) unveiled its first accessories designed in collaboration with Apple to perfectly complement the aesthetics and features of the new iPad Pro™: the Logi CREATE Backlit Keyboard Case with Smart Connector and the Logi CREATE Protective Case with Any-angle Stand. The Logi CREATE Keyboard Case is the first third-party keyboard on the market to leverage Apple’s new Smart Connector™, eliminating the need to power on, connect or charge the keyboard. The Logi CREATE Backlit Keyboard Case is designed to work exclusively with Apple’s new Smart Connector for seamless communication between the iPad Pro and the keyboard. Through leveraging the Smart Connector, the Logi CREATE keyboard automatically powers on and securely connects with the iPad Pro when placed in the typing position – no Bluetooth® pairing needed. And because the keyboard is powered by the iPad Pro, you never have to think about charging your keyboard again. The Logi CREATE Backlit Keyboard Case is built for productivity. The keyboard features full-size 19 mm keys, adjustable backlighting and an intuitive layout, helping you take full advantage of the iPad Pro’s expansive workspace and new iOS® 9 features. The iOS shortcut keys also put the power of your favorite apps at your fingertips – you can activate search and media controls without ever leaving the keyboard. The case provides two viewing angles, so you can make the most of the iPad Pro’s big, beautiful screen whether you're posting an update, watching videos, or using the Apple Pencil to take notes. The Logi CREATE Backlit Keyboard Case is available for a suggested retail price of $149.99. The Logi CREATE Protective Case with Any-angle Stand adjusts to whatever adventure comes your way. The case’s flexible stand has a hidden hinge that firmly holds your iPad Pro in the perfect viewing angle within a 60-degree range. Place the iPad Pro upright in the stand for watching video in comfort or nearly flat for sketching with the Apple Pencil – there’s an angle for nearly every activity or work setup. The Logi CREATE protects the front and back of your iPad Pro without adding unnecessary bulk or weight. The Logi CREATE Protective Case with Any-angle Stand is available for a suggested retail price of $79.99. The Logi CREATE Backlit Keyboard Case and the Logi CREATE Protective Case with Any-angle Stand are available in a variety of colors including black, red or blue. Both are expected to be available online and in Apple stores in the U.S., and select countries in Europe and Asia beginning November 2015, at the same time the iPad Pro becomes available. For more information, please visit Logitech.com, our blog or connect with us on Facebook. 2015 Logitech, Logicool, Logi and other Logitech marks are owned by Logitech and may be registered. All other trademarks are the property of their respective owners. For more information about Logitech and its products, visit the company’s website at www.logitech.com.